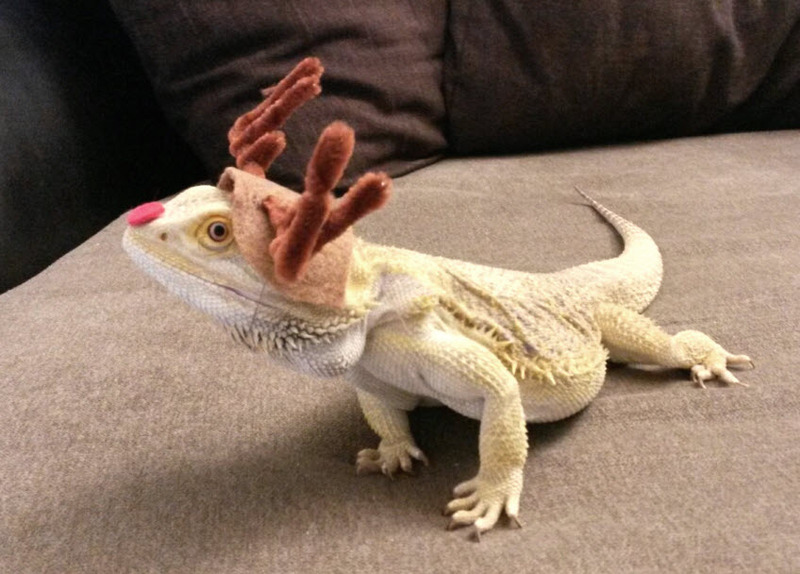 Dress your bearded dragon as Rudolph for Christmas! Draw the shape of a deer ear on a piece of paper, fold the paper at the base of the ear, then cut out the shape from the folded paper to make the shape of two deer ears connected at their bases. Use the paper template to cut the shape out of brown felt. Cut two holes on either side of the center of the ear piece, and thread a brown pipe cleaner through the holes. Bend the ends of the pipe cleaner into the shape of antlers. Cut out a small circle of red felt to make Rudolph’s nose. Put the costume parts on your dragon, using a dab of peanut butter to help them stick in place if needed.